Editor’s Note – Think one person can’t start a yardfarming movement? Think again. Seventeen-year-old Katie Stagliano has helped jumpstart 100 gardens in 33 states. This article was originally posted on Seedstock and written by Jocelyn Kerr. Katie Stagliano’s first cabbage fed more than 275 people. As an ambitious third grader in 2008, she nurtured a cabbage seedling in her backyard until it weighed about 40 pounds. Unsure what to do with her harvest, she approached the soup kitchen at Tri County Family Ministries in North Charleston, South Carolina. They turned her cabbage into soup, and Stagliano saw an opportunity to help feed families in need through gardening. To grow food for those in need, Katie and her family started Katie’s Krops, a nonprofit that helps kids across the country start their own gardens. Since its founding, Katie’s Krops has helped jumpstart 100 gardens in 33 states. Now, at 17 years old and getting ready for college, Stagliano is the youngest member of the Clinton Global Initiative and this June was recognized as a University of California Global Food Initiative “30 Under 30” recipient, an award given to young people who are addressing problems in the food system in creative ways. For the last six years, Katie’s Krops has hosted an annual anniversary dinner called the Garden to Table Dinner. Young people and community partners donate food and volunteer their time to provide a free dinner to anyone in the community who would like to come. Between attending classes and participating in swim meets and practices, Stagliano also travels nationwide to speak to groups about Katie’s Krops. She said maintaining a positive outlook is key in keeping her motivated. 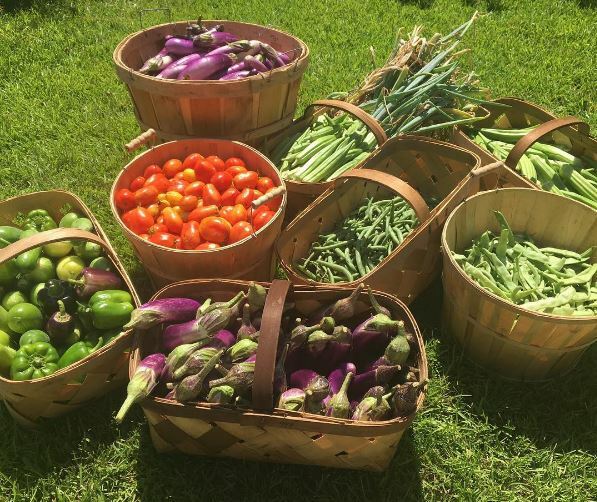 To help fulfill its mission, the organization holds an annual Katie’s Krops Growers application period from Oct. 1 to Dec. 31. Young people aged nine to 16 fill out an application, identify an adult to help manage the project and submit a letter of recommendation for consideration. If accepted into the program, kids are awarded up to $500 in garden center gift cards, they’re given access to a private gardening website and they become eligible for college scholarships and the annual Katie’s Krops summer camp, held on an organic farm in Pelion, South Carolina. The majority of the organization’s funding comes from corporate partnerships and private donations, but they are working on increasing its fundraising efforts, Stagliano said. “[Fundraising] takes so much time away from being in the garden. We struggle with that,” she said. As Stagliano makes decisions about college and considers her options for the future, she said she’s considering a career in mass communications. “Whatever I do in college, I want to bring it back to Katie’s Krops and keep it going as long as possible,” she said.